Those who are interested in that special attitude towards the universe which is now loosely called "mystical," find themselves beset by a multitude of persons who are constantly asking--some with real fervour, some with curiosity, and some with disdain--"What is mysticism?" When referred to the writings of the mystics themselves, and to other works in which this question appears to be answered, these people reply that such books are wholly incomprehensible to them.On the other hand, the genuine inquirer will find before long a number of self-appointed apostles who are eager to answer his question in many strange and inconsistent ways, calculated to increase rather than resolve the obscurity of his mind. He will learn that mysticism is a philosophy, an illusion, a kind of religion, a disease; that it means having visions, performing conjuring tricks, leading an idle, dreamy, and selfish life, neglecting one's business, wallowing in vague spiritual emotions, and being "in tune with the infinite." He will discover that it emancipates him from all dogmas--sometimes from all morality--and at the same time that it is very superstitious. One expert tells him that it is simply "Catholic piety," another that Walt Whitman was a typical mystic; a third assures him that all mysticism comes from the East, and supports his statement by an appeal to the mango trick. At the end of a prolonged course of lectures, sermons, tea-parties, and talks with earnest persons, the inquirer is still heard saying--too often in tones of exasperation--"What is mysticism?" 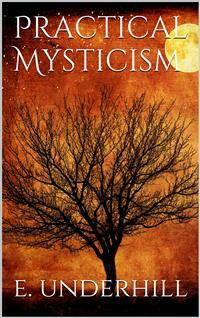 CHAPTER I WHAT IS MYSTICISM? This little book, written during the last months of peace, goes to press in the first weeks of the great war. Many will feel that in such a time of conflict and horror, when only the most ignorant, disloyal, or apathetic can hope for quietness of mind, a book which deals with that which is called the "contemplative" attitude to existence is wholly out of place. So obvious, indeed, is this point of view, that I had at first thought of postponing its publication. On the one hand, it seems as though the dreams of a spiritual renaissance, which promised so fairly but a little time ago, had perished in the sudden explosion of brute force. On the other hand, the thoughts of the English race are now turned, and rightly, towards the most concrete forms of action--struggle and endurance, practical sacrifices, difficult and long-continued effort--rather than towards the passive attitude of self-surrender which is all that the practice of mysticism seems, at first sight, to demand. Moreover, that deep conviction of the dependence of all human worth upon eternal values, the immanence of the Divine Spirit within the human soul, which lies at the root of a mystical concept of life, is hard indeed to reconcile with much of the human history now being poured red-hot from the cauldron of war. For all these reasons, we are likely during the present crisis to witness a revolt from those superficially mystical notions which threatened to become too popular during the immediate past.Yet, the title deliberately chosen for this book--that of "Practical" Mysticism--means nothing if the attitude and the discipline which it recommends be adapted to fair weather alone: if the principles for which it stands break down when subjected to the pressure of events, and cannot be reconciled with the sterner duties of the national life. To accept this position is to reduce mysticism to the status of a spiritual plaything. On the contrary, if the experiences on which it is based have indeed the transcendent value for humanity which the mystics claim for them--if they reveal to us a world of higher truth and greater reality than the world of concrete happenings in which we seem to be immersed--then that value is increased rather than lessened when confronted by the overwhelming disharmonies and sufferings of the present time. It is significant that many of these experiences are reported to us from periods of war and distress: that the stronger the forces of destruction appeared, the more intense grew the spiritual vision which opposed them. We learn from these records that the mystical consciousness has the power of lifting those who possess it to a plane of reality which no struggle, no cruelty, can disturb: of conferring a certitude which no catastrophe can wreck. Yet it does not wrap its initiates in a selfish and otherworldly calm, isolate them from the pain and effort of the common life. Rather, it gives them renewed vitality; administering to the human spirit not--as some suppose--a soothing draught, but the most powerful of stimulants. Stayed upon eternal realities, that spirit will be far better able to endure and profit by the stern discipline which the race is now called to undergo, than those who are wholly at the mercy of events; better able to discern the real from the illusory issues, and to pronounce judgment on the new problems, new difficulties, new fields of activity now disclosed. Perhaps it is worth while to remind ourselves that the two women who have left the deepest mark upon the military history of France and England--Joan of Arc and Florence Nightingale--both acted under mystical compulsion. So, too, did one of the noblest of modern soldiers, General Gordon. Their national value was directly connected with their deep spiritual consciousness: their intensely practical energies were the flowers of a contemplative life.We are often told, that in the critical periods of history it is the national soul which counts: that "where there is no vision, the people perish." No nation is truly defeated which retains its spiritual self-possession. No nation is truly victorious which does not emerge with soul unstained. If this be so, it becomes a part of true patriotism to keep the spiritual life, both of the individual citizen and of the social group, active and vigorous; its vision of realities unsullied by the entangled interests and passions of the time. This is a task in which all may do their part. The spiritual life is not a special career, involving abstraction from the world of things. It is a part of every man's life; and until he has realised it he is not a complete human being, has not entered into possession of all his powers. It is therefore the function of a practical mysticism to increase, not diminish, the total efficiency, the wisdom and steadfastness, of those who try to practise it. It will help them to enter, more completely than ever before, into the life of the group to which they belong. It will teach them to see the world in a truer proportion, discerning eternal beauty beyond and beneath apparent ruthlessness. It will educate them in a charity free from all taint of sentimentalism; it will confer on them an unconquerable hope; and assure them that still, even in the hour of greatest desolation, "There lives the dearest freshness deep down things." As a contribution, then, to these purposes, this little book is now published. It is addressed neither to the learned nor to the devout, who are already in possession of a wide literature dealing from many points of view with the experiences and philosophy of the mystics. Such readers are warned that they will find here nothing but the re-statement of elementary and familiar propositions, and invitations to a discipline immemorially old. Far from presuming to instruct those to whom first-hand information is both accessible and palatable, I write only for the larger class which, repelled by the formidable appearance of more elaborate works on the subject, would yet like to know what is meant by mysticism, and what it has to offer to the average man: how it helps to solve his problems, how it harmonises with the duties and ideals of his active life. For this reason, I presuppose in my readers no knowledge whatever of the subject, either upon the philosophic, religious, or historical side. Nor, since I wish my appeal to be general, do I urge the special claim of any one theological system, any one metaphysical school. I have merely attempted to put the view of the universe and man's place in it which is common to all mystics in plain and untechnical language: and to suggest the practical conditions under which ordinary persons may participate in their experience. Therefore the abnormal states of consciousness which sometimes appear in connection with mystical genius are not discussed: my business being confined to the description of a faculty which all men possess in a greater or less degree.The reality and importance of this faculty are considered in the first three chapters. In the fourth and fifth is described the preliminary training of attention necessary for its use; in the sixth, the general self-discipline and attitude toward life which it involves. The seventh, eighth, and ninth chapters treat in an elementary way of the three great forms of contemplation; and in the tenth, the practical value of the life in which they have been actualised is examined. Those kind enough to attempt the perusal of the book are begged to read the first sections with some attention before passing to the latter part.E. U.September 12, 1914. Those who are interested in that special attitude towards the universe which is now loosely called "mystical," find themselves beset by a multitude of persons who are constantly asking--some with real fervour, some with curiosity, and some with disdain--"What is mysticism?" When referred to the writings of the mystics themselves, and to other works in which this question appears to be answered, these people reply that such books are wholly incomprehensible to them.On the other hand, the genuine inquirer will find before long a number of self-appointed apostles who are eager to answer his question in many strange and inconsistent ways, calculated to increase rather than resolve the obscurity of his mind. He will learn that mysticism is a philosophy, an illusion, a kind of religion, a disease; that it means having visions, performing conjuring tricks, leading an idle, dreamy, and selfish life, neglecting one's business, wallowing in vague spiritual emotions, and being "in tune with the infinite." He will discover that it emancipates him from all dogmas--sometimes from all morality--and at the same time that it is very superstitious. One expert tells him that it is simply "Catholic piety," another that Walt Whitman was a typical mystic; a third assures him that all mysticism comes from the East, and supports his statement by an appeal to the mango trick. At the end of a prolonged course of lectures, sermons, tea-parties, and talks with earnest persons, the inquirer is still heard saying--too often in tones of exasperation--"What is mysticism? "I dare not pretend to solve a problem which has provided so much good hunting in the past. It is indeed the object of this little essay to persuade the practical man to the one satisfactory course: that of discovering the answer for himself. Yet perhaps it will give confidence if I confess pears to cover all the ground; or at least, all that part of the ground which is worth covering. It will hardly stretch to the mango trick; but it finds room at once for the visionaries and the philosophers, for Walt Whitman and the saints.Here is the definition:--Mysticism is the art of union with Reality. The mystic is a person who has attained that union in greater or less degree; or who aims at and believes in such attainment.It is not expected that the inquirer will find great comfort in this sentence when first it meets his eye. The ultimate question, "What is Reality?" --a question, perhaps, which never occurred to him before--is already forming in his mind; and he knows that it will cause him infinite distress. Only a mystic can answer it: and he, in terms which other mystics alone will understand. Therefore, for the time being, the practical man may put it on one side. All that he is asked to consider now is this: that the word "union" represents not so much a rare and unimaginable operation, as something which he is doing, in a vague, imperfect fashion, at every moment of his conscious life; and doing with intensity and thoroughness in all the more valid moments of that life. We know a thing only by uniting with it; by assimilating it; by an interpenetration of it and ourselves. It gives itself to us, just in so far as we give ourselves to it; and it is because our outflow towards things is usually so perfunctory and so languid, that our comprehension of things is so perfunctory and languid too. The great Sufi who said that "Pilgrimage to the place of the wise, is to escape the flame of separation" spoke the literal truth. Wisdom is the fruit of communion; ignorance the inevitable portion of those who "keep themselves to themselves," and stand apart, judging, analysing the things which they have never truly known.Because he has surrendered himself to it, "united" with it, the patriot knows his country, the artist knows the subject of his art, the lover his beloved, the saint his God, in a manner which is inconceivable as well as unattainable by the looker-on. Real knowledge, since it always implies an intuitive sympathy more or less intense, is far more accurately suggested by the symbols of touch and taste than by those of hearing and sight. True, analytic thought follows swiftly upon the contact, the apprehension, the union: and we, in our muddle-headed way, have persuaded ourselves that this is the essential part of knowledge--that it is, in fact, more important to cook the hare than to catch it. But when we get rid of this illusion and go back to the more primitive activities through which our mental kitchen gets its supplies, we see that the distinction between mystic and non-mystic is not merely that between the rationalist and the dreamer, between intellect and intuition. The question which divides them is really this: What, out of the mass of material offered to it, shall consciousness seize upon--with what aspects of the universe shall it "unite"?It is notorious that the operations of the average human consciousness unite the self, not with things as they really are, but with images, notions, aspects of things. The verb "to be," which he uses so lightly, does not truly apply to any of the objects amongst which the practical man supposes himself to dwell. For him the hare of Reality is always ready-jugged: he conceives not the living lovely, wild, swift-moving creature which has been sacrificed in order that he may be fed on the deplorable dish which he calls "things as they really are." So complete, indeed, is the separation of his consciousness from the facts of being, that he feels no sense of loss. He is happy enough "understanding," garnishing, assimilating the carcass from which the principle of life and growth has been ejected, and whereof only the most digestible portions have been retained. He is not "mystical. "But sometimes it is suggested to him that his knowledge is not quite so thorough as he supposed. Philosophers in particular have a way of pointing out its clumsy and superficial character; of demonstrating the fact that he habitually mistakes his own private sensations for qualities inherent in the mysterious objects of the external world. From those few qualities of colour, size, texture, and the rest, which his mind has been able to register and classify, he makes a label which registers the sum of his own experiences. This he knows, with this he "unites"; for it is his own creature. It is neat, flat, unchanging, with edges well defined: a thing one can trust. He forgets the existence of other conscious creatures, provided with their own standards of reality. Yet the sea as the fish feels it, the borage as the bee sees it, the intricate sounds of the hedgerow as heard by the rabbit, the impact of light on the eager face of the primrose, the landscape as known in its vastness to the wood-louse and ant--all these experiences, denied to him for ever, have just as much claim to the attribute of Being as his own partial and subjective interpretations of things.